Term extraction is the task of automatically detecting, from textual corpora, lexical units that designate concepts in thematically restricted domains (e.g. medicine). Current systems for term extraction integrate linguistic and statistical cues to perform the detection of terms. The best results have been obtained when some kind of combination of simple base term extractors is performed . In this paper it is shown that this combination can be further improved by posing an additional learning problem of how to find the best combination of base term extractors. 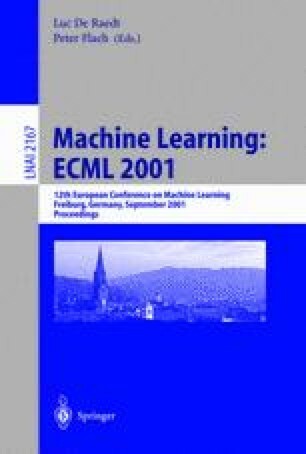 Empirical results, using AdaBoost in the metalearning step, show that the ensemble constructed surpasses the performance of all individual extractors and simple voting schemes, obtaining significantly better accuracy figures at all levels of recall.